Vikas Galera, Ankit Sharma, Abhishek Gaurav, Rajat Moona, "e;Method and System for usig personal devices for authentication and service access at service outlets$quote; Applied for US patent. devices for authentication and service access at offline service outlets"e; Applied for Indian Patent. Vikas Galera, Ankit Sharma, Abhishek Gaurav, Rajat Moona, "e;Using personal devices for authentication and service access at offline service outlets"e; Applied for Indian Patent. Rajat Moona, R Gopalakrishnan, Russell Klein, "Area optimization of hardware for algorithms by optimizing sizes of variables of the algorithm." US Patent pre-grant Publication 20060020574. Rajat Moona, Russell Klein, "Repartitioning performance estimation in a hardware-software system." US Patent No. 6856951. C. Siva Ram Murthy, Rajat Moona, V. Rajaraman, "A Multiprocessor Architecture for Weather Modeling", Proc. Second Int. Conf. on Supercomputing, Santa Clara, CA, USA, vol. 1, May 3-8, 1987, pp. 336-342. M. K. Srinivas, S. K. Nandy, Rajat Moona, "Implementation Issues of a two layer Blocked Router based on Lee's Algorithm on Personal Computers", Proc. IEEE TENCON 1987, Seoul, Korea, pp. 774-778. S. K. Nandy, Rajat Moona, S. Rajagopalan, "Linear Quadtree Algorithms on the Hypercube", Proc. International Conference on Parallel Processing 1988, USA, pp. 227-229. Rajat Moona, V. Rajaraman, "A Broadcast Cube Multiprocessor Architecture", Proc. CA-DSP '89, Int. Symp. on Computer Architecture and Digital Signal Processing, Hong Kong, Oct. 11-14, 1989. Rajat Moona, V. Rajaraman, "A Software Environment for General Purpose MIMD Multiprocessors", Proc. IEEE TENCON 89, Bombay, Nov. 22-24, 1989. pp. 98-101. Rajat Moona, V. Rajaraman, "Design and Implementation of a Broadcast Cube Multiprocessor", Proceedings of International Conf. on Knowledge Based Computer Systems, KBCS, Bombay, Dec. 11-13, 1989, pp. 52-63. S. K. Nandy, Anuradha D., Rajat Moona, C. Sudha Madhuri, "K-d tree based grid-less maze routing on message passing multiprocessor system", Jl. of the Institution of Electronics and Telecommunication Engineers, vol. 36, nos. 3-4, 1990, pp. 287-293. Rajat Moona, V. Rajaraman, "Multidimensional Multilink Multicomputer: A General Purpose Parallel Computer", Jl. of IISc., vol. 71, Mar-Apr 1991, pp. 105-116. Rajat Moona, V. Rajaraman, "A FIFO based multicast network and its use in multicomputers", Microprocessors and Microsystems, vol. 15, no. 10, December 1991, pp. 543-547. Rajat Moona, B.S. Pawa, "Unix Implementation on a message passing multicomputer", Jl. of CSI, spl. issue on parallel computing, vol 23, no 1, March 1993. I. Sarkar, Rajat Moona, "Design of a CMOS Link adapter for circuit switched multicomputer networks", Proceedings of 1993 international conference on Application Specific Integrated Circuits, ASIC '93, Rochester, USA, Sep 27-Oct 1, 1993. Manoj Misra, Rajat Moona, "Design of Systolic Arrays for QR decomposition", Proc. Int'l conf. on Comp. Systems and Education, Bangalore, June 22-25, 1994, pp. 247-255. Rajat Moona, Sanjeev Kumar, "Twine RISC: A high performance multithreaded RISC architecture", Proc. Int'l workshop on parallel processing, Bangalore, Dec. 26-31, 1994, pp. 222-227. P. Suresh, Rajat Moona, "A Case for Register-less Processor", Proceedings of 4th international conference on High Performance Computing, HiPC 97, Bangalore, Dec. 97. P. Suresh, Rajat Moona, "PERL - A Registerless Architecture", Proceedings of 5th international conference on High Performance Computing, HiPC 98, Chennai, Dec. 98. 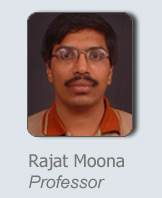 V. Rajesh, Rajat Moona, "Processor Modeling for Cycle Based Software Estimation", Proceedings of Cadence Technical Conference, San Antanio, Texas, USA, May 1998, pp. 81-87. Praveen B, Deepak Gupta, Rajat Moona, "Design and Implementation of a File System with on-the-fly Data Compression for GNU/Linux", Software - Practice and Experience, Vol.29., No. 10, Aug. 99, pp. 863-874. Y. Subhash Chandra, Rajat Moona, "Retargetable Functional Simulator using High Level Processor Models" Proceedings VLSI 2000. Rajat Moona, "Processor Models for Retargetable Tools", Proceedings eleventh IEEE International Workshop on Rapid Systems Prototyping, 21-23 June 2000, Paris, pp. 34-39. A. Mujoo, Manoj Malviya, Rajat Moona, T.V. Prabhakar, "A Search Engine for Indian Languages", Proceedings Electronic Commerce and Web Technologies, EC-WEB, Eleventh International Conference on Database and Expert Systems Applications, London, Sept 2000. R Ravinderan, Rajat Moona, "Retargetable Cache Simulation Using High Level Processor Models", Proceedings Australasian Computer Systems Architecture Conference ACSAC 2001, Jan 29-30, 2001, pp. 114-121. R Ravinderan, Rajat Moona, "Retargetable Program Profiling Using High Level Processor Models", HiPC 2001, Hyderabad, India, Dec. 17-20, 2001. Souvik Basu, Rajat Moona, "High Level Synthesis from Sim-nML Processor Models", VLSI 2003, Delhi, India, Jan 4-8, 2003, pp. 255-260. Russell A Klein, Rajat Moona, "Migrating Software to Hardware on FPGAs", International Conf. on Field Programmable Technologies, ICFPT04, Brisbane, Australia. R. Gopalakrishnan, Rajat Moona, "Variable resizing for area improvement in behavioral synthesis", International Conf. on VLSI Design, Kolkata, Jan 3-7, 05. Russell A Klein, Rajat Moona, "Measuring and Tuning Real-Time Performance of Embedded Systems", Embedded System Conference, San Francisco, March 6-10, 2005. (also at Embedded System Conference, Munich, November, 9-11, 2004). Satyam sharma, Rajat Moona, Dheeraj Sanghi, "TransCrypt: A secure and transparent Encrypting File System for Enterprises", 8th International Symposium on Systems and Information Security (SSI 2006), Sao Paulo, Brazil, November 8-10, 2006. Riyaz S, Rajat Moona, "Graph based model for Object Access Analysis at OSD Client", Workshop on Storage Technlogies in Computing Clusters and Data Center Environments, High Performance Computing (HIPC07), Dec 2007, Goa. Abhishek Gaurav, Ankit Sharma, vikas Gelara, Rajat Moona, "Using Personal Electronic Device for Authentication-based Service Access", IEEE International Conference on Communications (ICC2008), Beijing, 19-23 May 2008. Anirudh Ghayal, Mohd. Zuber Khan, Rajat Moona, "SmartRF: A Flexible and Light-weight RFID Middleware", IEEE International Conference on e-Business Engineering (ICEBE), October 22-24, 2008, Xi'an, China (to be published).